"Yo ho, yo ho, a pirate's life for me. Drink up me 'earties, yo ho." Ahoy! 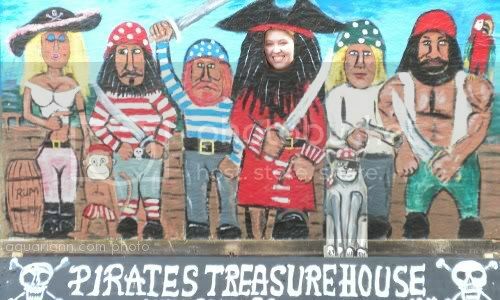 Ogre commandeered this capture of me and a wooden pirate crew at Pirates Treasure House in Little River, NC last December ... but I thought fitting to share this gem today. Happy Talk Like a Pirate Day! Ah ha ha I love it! ARGHHHH...great image! Thanks for hosting and have a great week. This is so cool! Thanks for hosting and Happy WW! How FUN!! Pirate day...man, I am outta the loop! LMAO! Ahoy saucy wench! (I had to look that up, I'm afraid) Cute photo! That is so great! You look good, too. Perfect timing, I've just been teaching my little guy how to talk like a pirate - "Aaaaargh!" Ahoy Matey! This is my most favorite super random holiday. How cute. My kids take photos like that every year when we visit the amusement park. What fun! Interesting crew you run with. Fun photo. Arggghhh! Happy Talk like a Pirate day back at ye! A fine booty of sea-worthy Pirates!